Two new faculty joined the department as Visiting Assistant Professors in Fall '14, and they will continue with us for Spring '15. They are Andrew Gainer-Dewar, shown on the left below, and Jacquelyn Rische, shown in the center. Also continuing in the Spring will be our math intern, Josh Danis, shown on the right below. 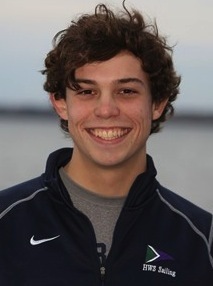 Josh graduated from Hobart last year with a major in Mathematics. Professors Kevin Mitchell and David Eck are on leave for the Spring semester. Professor Carol Crithlow, who was on leave for the past year, returns to teaching in the Spring. It is with great sadness that I write with the news that Professor Emeritus of Mathematics Larry Smolowitz passed away Friday, December 20, 2013 at Strong Memorial Hospital. Professor Smolowitz retired from teaching in 2004 after nearly 40 years of distinguished service to the Colleges. A valued member of our community, Larry chaired the Department of Mathematics on a number of occasions and served important roles in faculty governance. He will perhaps be best remembered for his dedication to the intellectual development of his students and for the many kindnesses he showed them. I can recall many evenings when, during my walk home from Coxe Hall, Larry would be in his office meeting with students to help them better understand calculus, abstract algebra, and probability. A gifted mathematician, Larry received his bachelor's degree from RPI and his doctorate from the University of Minnesota. Memorial contributions in his memory may be made to Temple Beth-El, Geneva Scholarship Associates at HWS, the Parkinson Research Foundation, or a charity of one's choice. 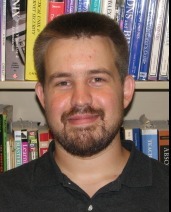 Professor Jonathan Forde has been granted tenure at Hobart and William Smith Colleges. 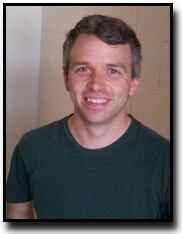 With tenure, Forde becomes a permanent member of the faculty of the Colleges and of the Department of Mathematics and Computer Science. Tenure also carries a promotion from Assistant Professor to Associate Professor. Tenure marks one of the most important milestones in the career of a professor. It is granted by the Board of Trustees after a careful review and recommendation by the Department, the faculty Committee on Tenure and Promotion, the Provost, and the President of the Colleges. The review generally takes place in the sixth year of teaching. The faculty of the Department of Mathematics and Computer Science has three new members this Fall. 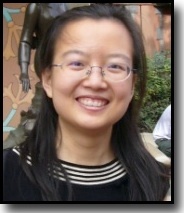 Professor Yan Hao joins the department in a tenure-track position in applied mathematics. She received her Ph.D. from the College of William and Mary and spent a year in a post-doctoral position at Arizona State University before coming to Hobart and William Smith Colleges. Her interests include Computational Biology and Numerical Analysis. Professor Eric Nelson and Professor Mark Radosevich join the department as Visiting Assistant Professors of Mathematics for the 2012--13 academic year. 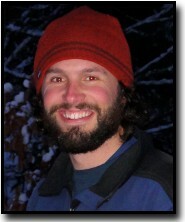 Eric Nelson completed his Ph.D. at Colorado State University and is interested in group theory, finite geometry, and mathematics education. Mark Radosevich's Ph.D. is from Brandeis University; his interests include low-dimensional topology and mathematics education. 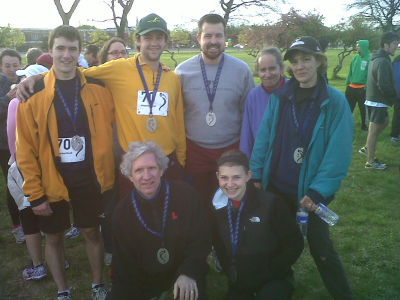 Integrated Circuit, the Department's seven person running team again ran in this year's Seneca 7 Relay Race on April 28. The race is 77.7 miles around around Seneca Lake. Each runner completes three of the 21 different legs of the course which starts and ends in Geneva. The team finished in 10 hours, 41 minutes and 57 seconds (8:15 pace) which was good enough for 54th place out of 154 teams. While other teams from the Colleges competed, ours was the only department at HWS to field an entire team. Running for Integrated Circuit this year were: Top: Nicholas MacDonald (H'12), Trevor Gionet, (H '12), Professors Jon Forde, Stina Bridgeman, and Carol Critchlow. Bottom: Professor Kevin Mitchell and Abigael Blumenthal (WS '14). All of the faculty competed last year as well. Andrew Wiles devoted much of his career to proving Fermat's Last Theorem, a challenge that perplexed the best minds in mathematics for 300 years. In 1993, he made front-page headlines when he announced a proof of the problem, but this was not the end of the story; an error in his calculation jeopardized his life's work. In this interview, Wiles recounts how he came to terms with the mistake, and eventually went on to achieve his life's ambition. The department will show the movie on Thursday, December 1st at 7:30pm in Albright Auditorium. Refreshments will be provided. Bring your friends!